Since 2015, GenkiJACS’ Fukuoka Japanese school is fully accredited by the Japanese government to provide student visas for long-term study. The detailed and exacting accreditation process means you can trust that our teachers and courses meet the government’s high standards. The benefits of studying on a student visa include longer stays, work rights, and student discounts. Click here to read more about student visas! GenkiJACS is accredited by the International Association of Language Centres (IALC). IALC is a network of high-quality, independent language schools teaching their native language to international students. The IALC Quality Scheme and Code of Ethics ensure that all IALC schools provide high quality language services. IALC-accredited language schools provide effective language courses and cultural immersion for all ages, needs and interests. Accreditation is a guarantee of quality, as IALC inspects schools regularly. GenkiJACS is only the third Japanese school ever to be accepted by IALC, and one of only two currently maintaining membership. Click here to read more about our IALC accreditation! The Centrala studiestödsnämnden approves and sends out Swedish financial aid for studies, which includes both grants and loans to students in Sweden and abroad. Genki Japanese School is accredited by the CSN, allowing Swedish students to receive financial support for Japanese language study with us. GenkiJACS is part of the Japan Tourism Agency’s program to provide support for foreigners coming to Japan. GenkiJACS is recognized by most German state authorities as eligible for up to an extra 10 days of educational leave, for Japanese language courses of more than 30 hours per week. See our Bildungsurlaub page for details. Genki Japanese School is accredited by multiple universities worldwide, allowing students to receive credit at their university for their study with GenkiJACS. Check our university page for details! The Star Awards are the language school industry equivalent of the Oscars, where each year people vote in more than 20 categories to decide the top performers in the industry. 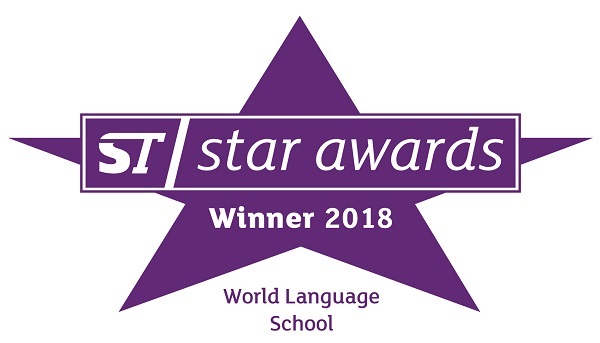 Having been nominated by popular vote as one of the world's star language schools every year from 2009 to 2018, Genki Japanese Language School won the World Language Schools category in 2018! This means we’re not just the top Japanese language school in the world for 2018, but the top language school! This is an incredible honor for us, particularly as we are the first Japanese language school ever to win this award. Students coming to GenkiJACS through Languagecourse.net have rated us every year since 2008 as 4.5 or higher out of 5 on average, “certifying an excellent overall service rating based on the evaluations of former students”. High evaluations by former clients are the best reflection of the high quality of service we provide!